(Host) Vergennes is drafting rules for holiday displays in the city-owned park. 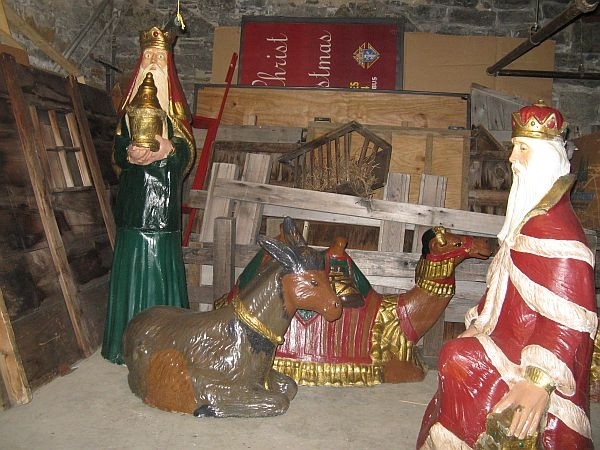 The move comes after a resident raised concerns about a nativity scene that appears every December. But, as VPR’s Melody Bodette reports, decision is complicated by the fact that no one is sure who owns the structure. (Bodette) Decades ago, Roger Hayes saw an older man dragging a crèche onto the green and offered to help set it up. Eventually it became a yearly tradition for his family to help. (Bodette) Hayes believes parts of the crèche may date back to the 1940s. Eventually he took over it’s care. Hayes now stores it in the basement of the Catholic Church. (Hayes) "I make it look like it’s a barn yard. I added some sheep there’s a pen, you know." (Bodette) And there’s the statues of Mary, Joseph, and the three kings. And they’ve been added to over the years. One is made of wood. (Hayes) "The rest of this is all foam." (Bodette) Someone donated a new Jesus one year. The figures were restored by high school students another year. And lately, members of the Lions Club have helped Hayes set up the crèche. But Hayes says he doesn’t own it. (Hayes) "Nobody has any papers that says, ‘We own it.’ It’s just that I felt like I was a guardian for people in general that wanted to see it." (Bodette) Now, though, the city has received a letter questioning why a religious symbol is allowed on public property each year. So city officials say someone needs to claim ownership. And that may be Hayes. He says he understands the concern. (Hayes) "It’s legitimate. And that’s why over the years, I knew of other disgruntlement in other cities, that it was because of taxpayer money and city employees. We’ve not ever had that here. It’s been individuals erecting it. Yes, it’s on public property. But I mean I pay taxes, and hopefully I have the use of that park just like everybody else." (Bodette) At a downtown coffee shop, Hannah Weisman explains why she wrote that letter. She says she purposely waited to write until after Christmas. She understands that many people have a strong emotional attachment to the crèche. But she says the time had come to speak up. (Weisman) "It’s a very religious symbol. It’s a full nativity scene. And it’s about two-thirds life size. It makes a loud statement. For me, the issue is not just it exists. It just looks like the city of Vergennes is making a religious statement. " (Bodette) And her concerns have been heard. The City Council has decided to draft a policy saying that private groups must file permits for displays on the green. And they must post a sign saying that the City doesn’t endorse or oppose the display. Weisman says she’s largely satisfied with the proposed policy. The draft cites language from the Secretary of State’s office, but the City also included legal advice from a firm affiliated with an evangelical university. Standing in the park, Mayor Mike Daniels says the experts back up the City’s belief that with a policy displaying the crèche here is lawful. (Daniels) "We have looked at other sources of information of some which came later, after the information was posted on the website." (Bodette) And he says the majority of emails from city residents have approached the issue thoughtfully. (Daniels) "Most of them are for keeping the crèche, very few are against having the crèche." (Bodette) The City has also decided to divest itself of a fund bequeathed to the city in the early 1980s for the creche’s maintenance. The hope is to turn the $2,000 over to whatever group claims ownership. (Host) The Vergennes City Council will discuss the draft policy at a meeting Tuesday at 7 p.m. at the Vergennes Opera House.